This week in Episode 113 of Delivering Marketing Joy! 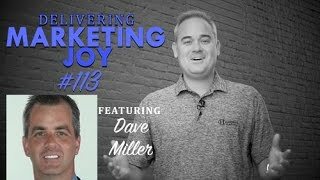 In this, his episode Kirby interviews Dave Miller and they discuss lessons he has learned from content marketing.Dave Miller is theVP of sales and marketing at Bruse FOX.one of the first questions Kirby asks is why Dave decided to participate in more content marketing for the business. According to Dave, they have only been participating in this form of marketing since June 1 of this year. I have been able to see a lot of changes. This helps them develop a lot of knowledge about their products and what they could do to prove their services. This is not just a one-way educational experience. Dave also brings up what he considers Three Tiered Reckoning. The first tier is the eternal question: This is when you ponder if you’re doing the same thing and expecting a different outcome. Many people are guilty of doing this, you have to change your game to get different results. So instead of just fussing out what is working change it and find wood does. Second philosophy: Today in the marketing world possible customers are being slim with advertising from every direction and they just end up ignoring. So what makes your message stand out. Make sure that you know exactly who you’re trying to reach. People know when you’re just being broad. Then communicate a simple message explaining how you will meet their need. Third is cultural: Don’t just expect you know what media to use. Do your research and find out what your specific marketing segment response to. Watcher numbers see if one message gets a better response than another. Continue to change the time and you will get those results that you’ve been looking for. Another important question asked were what lessons have you learned since you started working with social media. Dave discusses how important it is to communicate goals. Especially communicating your goal to help your customers grow their businesses. Align you’re goals so that they will meet their challenges. Fix the problem by making it a positive experience that they don’t even have to think about. The easier you can make it for the customer the better your results. And if you’re having trouble finding inspiration go to the people on the front lines. Those are the people who know exactly what’s going on with their customers and can tell you what information they’re looking for. Want to keep up all the time? Make sure to join our VIP List! Our VIP’s get an email with the latest content…and other special offers as well. Join here.